When I started my Little Stitches Hand Sewing class, my first students were newly 4 years old. As with any class, structure is needed. The challenge here was for our time to appear ‘organic’ and fun. We would start each 60 minute class time with our sewing song. ( I love making up thematic songs to familiar tunes; the following song is to the nursery tune “Mary Had a Little Lamb”) First, I told them story of Dorcas in Acts 9:36-41, then taught them this song. To cloth and help the poor. Then we would go over our class “rules” before starting our activities. Here is the list of sewing-themed brain breaks that I came up with. Preposition Play Obstacle Course: to reinforce positional words we will use in class – around, over, under, through, on. Sewing Objects in Mystery Box: I would put sewing objects in the box and another set in plain view. We would play two ways. First, they would feel the object and show us the matching one on the table. Then we would take turns pointing to an object in plain view, and the finder would need to find it by touch only. Gluing fabric squares on card stock with one inch grids, using a glue stick. This can be laminated and turned into a place mat. (This one is better for older students, but could be made to work for ages 4-6.) I think it was called “Railroad Word Game”; I changed it to “Stitch a Word”. The first person says a sewing related word and the next person has to say a sewing related word that starts with the last letter of the word just given. It is easiest to have the words written on individual cards that you can read to them, and even color coded for success. Example – ButtoN, NeedlE, Embroidery hooP, PinS, StitcH, Hand sewinG, GatheR, Running stitcH, Hide knoT, ThreaD, DorcaS, Scissors. Future posts will cover the goals for each week and the projects we completed. 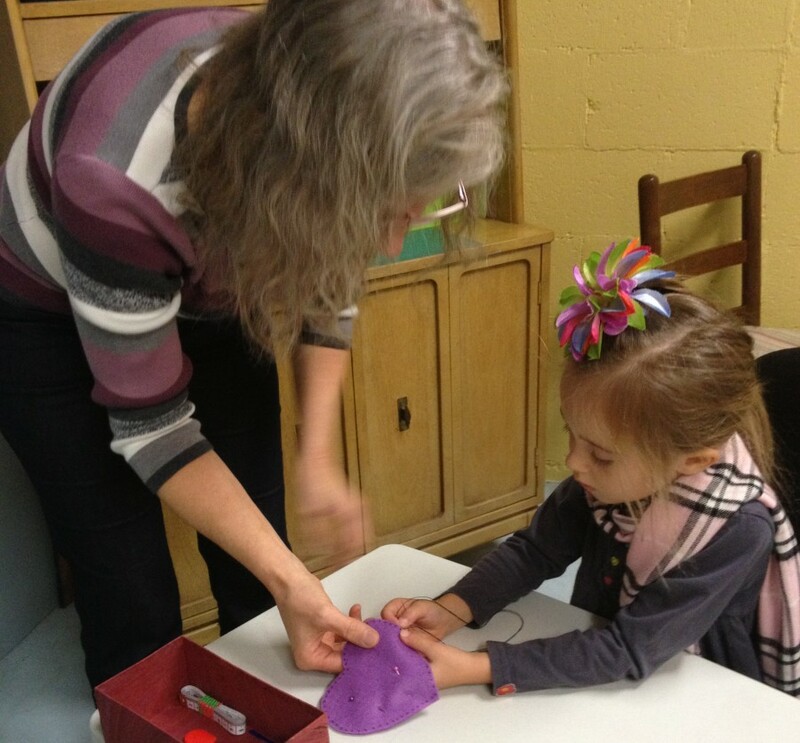 This entry was posted in Hand Sewing and tagged brain breaks, Hand Sewing, young children. Bookmark the permalink.